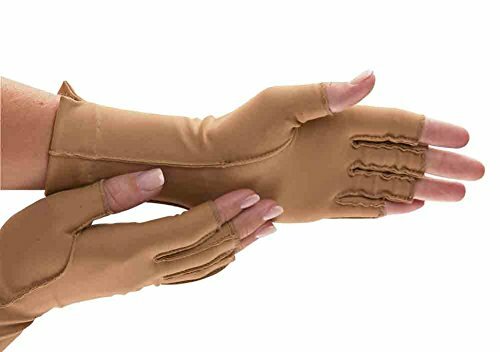 Isotoner Therapeutic Gloves Moderate compression helps ease pain and swelling due to Arthritis or injury. Seams are on outside and away from pain sensitive areas. Use day or night during rest and activity. Compression estimated from circumference around knuckles at 23-32 mmHg. Fiber content: 80% Nylon, 20% Lycra Spandex. Not made with natural rubber latex. Sizing: Measure circumference around MP joints. X-Small: 4-1/2" to 5-1/2" (11-14cm) Small: 5-1/2" to 6-1/2" (14-17cm) Medium: 6-1/2" to 7-1/2" (17-19cm) Large: 7-1/2" to 8-1/2" (19-22cm).